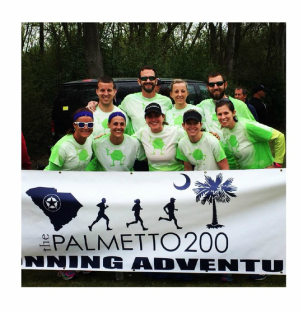 When someone on Etsy asked if I could make 12 Mike Wakowski shirts for their team to wear in a race, I was SUPER excited! (I also gave them a really great price break for ordering 12.) 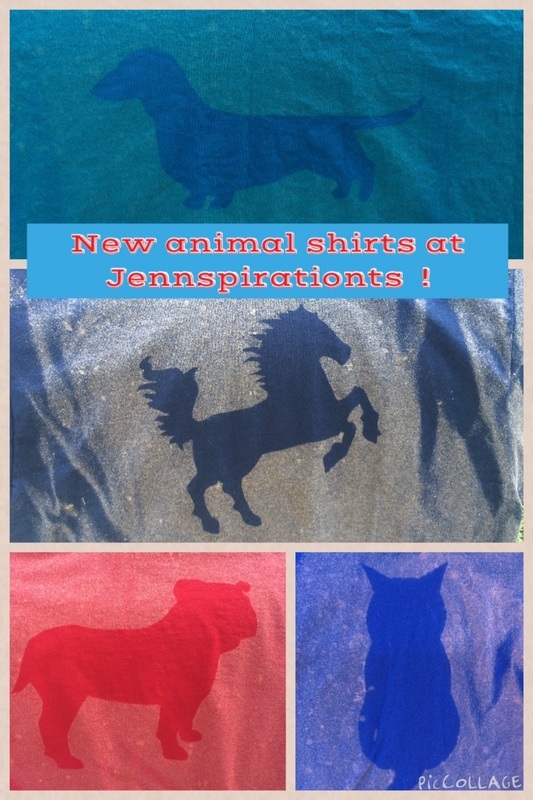 Luckily - they were willing to let me post their picture so that you could see my bleach art shirts in action! 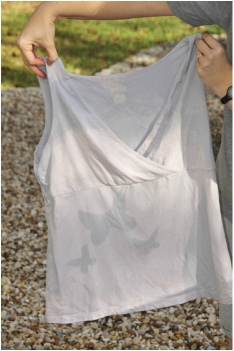 This project is an "upcycle" project. 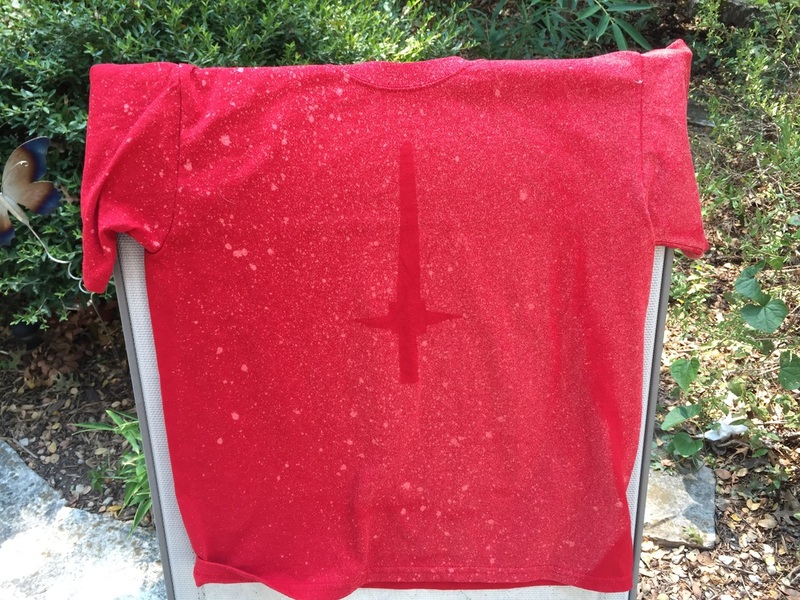 A friend of mine gave me this shirt because it had bleach stains on it anyway. Don't you hate it when that happens? Now, you'll know exactly what you can do the next time that happens! Original bleach spots clearly visible - but no worries because they will soon be part of the art! 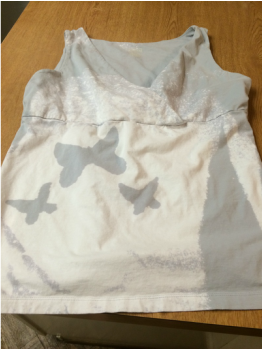 Then it's time to cut out my butterflies and stick them on the shirt (avoiding the bleach areas because I want the butterflies to be the color of the shirt). - I converted a few cookie trays into bleach trays that I keep outside because I like to have a cookie tray between the front and back of my shirts. It would have been great to get a picture of that for you...but trust me, it's there. - I enjoy having wrinkles in my shirts because I think part of the charm is that every pattern is a little bit different. - My bleach/water ratio is about 50/50 and after each spraying session, I squirt regular water through the sprayer (from a regular glass) to clear out the bleach and prolong the life of my sprayer. 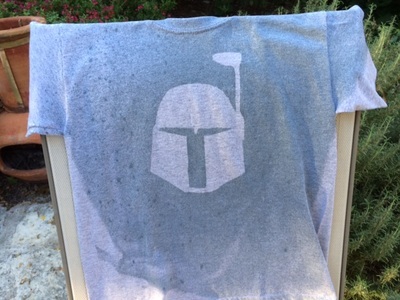 Right after spraying, while it is still wet. 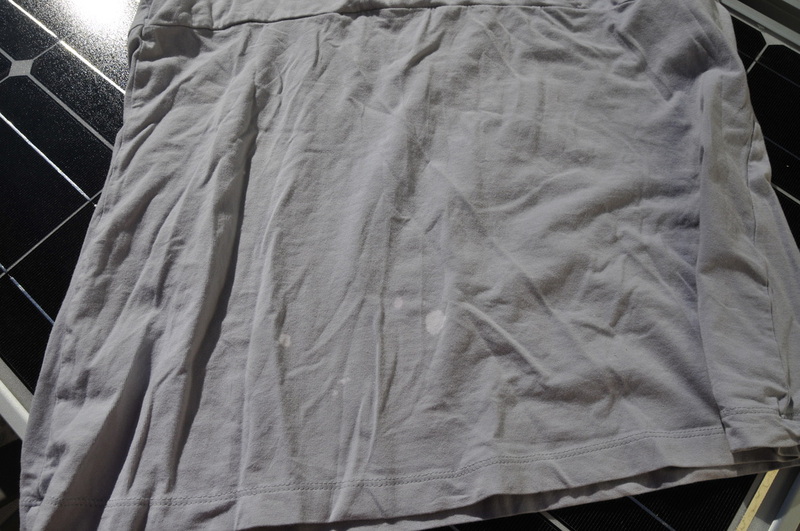 After air-drying and then completely clean (washed and dried). You can see it gets a bit darker. Ta-dah! Easy peasy, right? Feel free to ask any questions you have and have fun - don't stress out because it's a cheap hobby and as long as you don't spray bleach-water while wearing nice clothes, you shouldn't be out very much money. 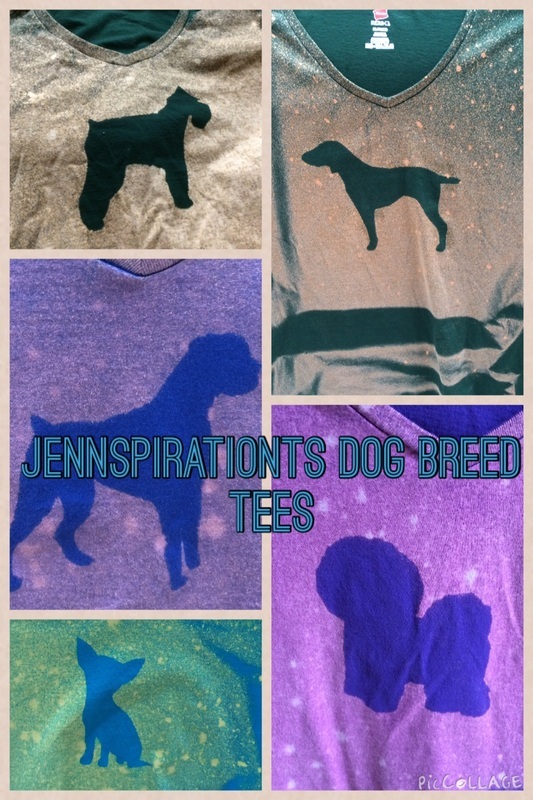 I'd love to see pictures of any shirts you create so let me know if you take the plunge! 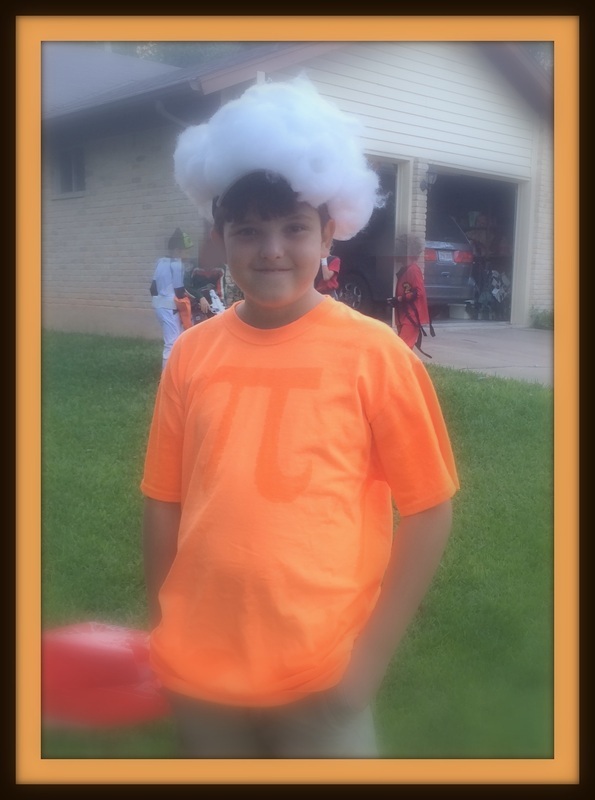 It's November - Time for Pi! 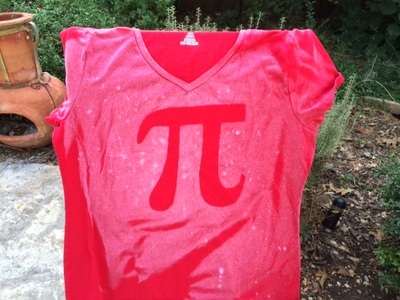 Kudos to Real Simple for the pumpkin pi shirt idea. 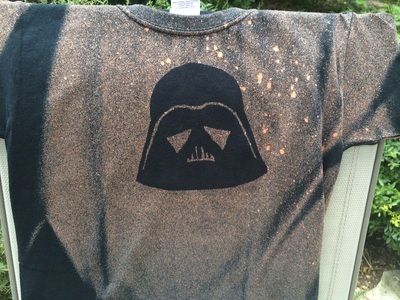 My son liked it, but instead of taping a pi symbol on an orange shirt he asked if I could bleach-art it. You know what, kiddo....I think I can! Then I came up with cotton on a cap because...of course...whipped cream. Yum. Suddenly it occurred to me that I was missing out on the whole mathematical geek world AND I remembered that last year, on March 14th, I got super excited about this year's Pi Day. Specifically - this year's Pi Day at 9:26 a.m. and p.m. Because that will be the most awesome moment in Pi Day history, as far as I'm concerned. 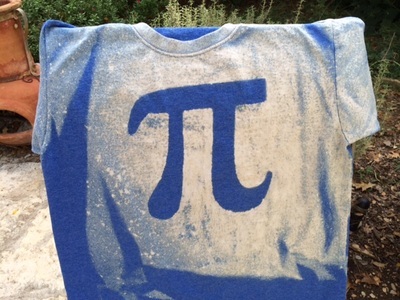 Here are a couple of my artistically-rendered Pi Shirts - for your favorite mathematician or someone who just appreciates a lovely mathematical symbol representing a cool never-ending number. Get ready to fly your Nerd Flag, folks! 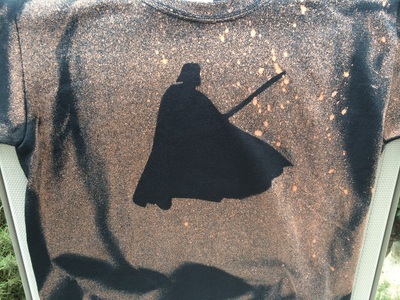 May The Bleach Be With You...Always. 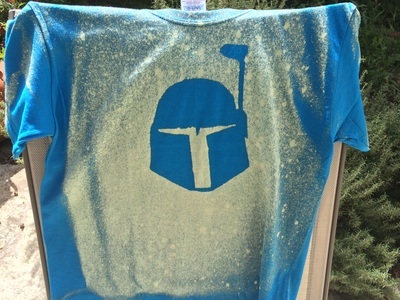 Even better, a wanna-be-Jedi can pretend to be Princess Leia as she sprays bleach on unsuspecting shirts. By the way - I've stretched my art towards the dark side with Darth Vadar and Boba Fett (or Jango Fett...whichever you prefer) shirts. So just click on the pictures below and you'll go straight to my Etsy store where you can purchase these Dark Side works of art. It's October, people....Time for Halloween!!!! Oh, October...you bring me such joy even though the high today in Austin, Texas will be 92 degrees. Who cares? This is the month when I get to dress up as a princess or pirate or suffragette one day as I'm doing my normal lawyer stuff. Thank goodness I work at a place with plenty of Halloween spirit. To celebrate this joyous occasion, I designed this cheerful ghost - and I must say I'm rather proud of him. (For some reason I think it's a guy...and I believe his name might be George. Order George soon for fun Halloween parties!